Ever wondered how a cheesecake tastes like that's made in an Instant Pot? Is it different from the one baked in an oven? 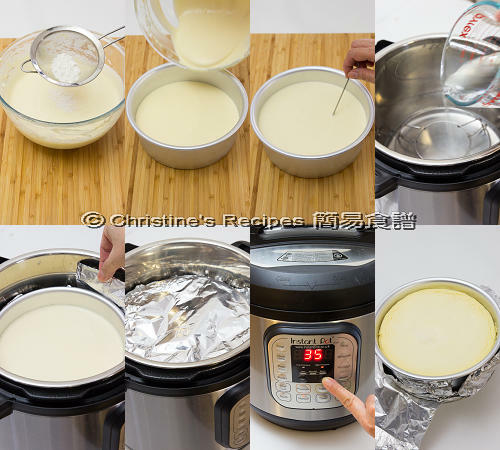 I was intrigued to try making cheesecake in my pressure cooker, Instant Pot. I converted our family’s favourite mini blueberry cheesecakes recipe and made a 7-inch round one. Then I brought it along to a party and shared with my friends. They were all fascinated after tasting it. The taste and texture were no difference, compared with those I baked in oven. The only complaint was that the cheesecake was too small for the party. Everyone could only have a tiny slice. It’s still a good thing that everyone’s sweet tooth was taken care of with a moderate portion. With my Instant Pot, under the hot weather down under here, I could make something delicious similar to the bakery goods. Yet, I didn’t need to turn up my oven, then heated up my kitchen. Extra bonus! 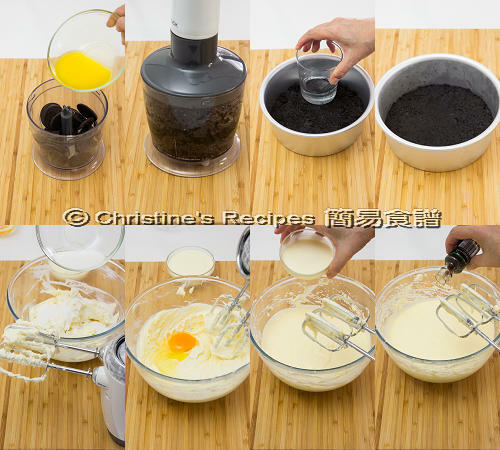 Put the Oreo biscuit in a food processor and pulse for a few times into crumbs. Pour in the melted butter and process thoroughly. Transfer into the lined cake mould. Lightly press and even the surface with a large spoon or the bottom of a cup. Refrigerate for about 20 minutes. In a large mixing bowl, beat the cream cheese and sugar with an electric mixer until smooth. Add one egg at a time. Combine very well. Mix in thickened cream and vanilla extract. Sift in the cake flour. Pour the batter into the cake mould. Lightly tap the cake mould a few times on the table to remove any air bubbles inside. Use a needle to poke away the air pockets on the surface. Wrap the mould bottom with foil. Place a long double-layered foil strip, 8-cm / 3-inch in width, under the ould, with both ends hanging out so that you can use them to lower the mould into your Instant Pot. Pour in 1½ cup of water into Instant Pot. Place a trivet. Carefully lower the cake mould on the trivet. Cover with foil to prevent any condensed water from dripping on the cake surface. Close the lid, turn pressure release handle to “Sealing”. Press“manuel”button, high pressure cooking for 35 minutes. Let pressure release naturally for 10 minutes. Remove the lid. Let the cake rest in the pot for 15 to 20 minutes. Remove the cake from the pot and let it cool completely on a wire rack. Refrigerate for at least 6 hours, or overnight. Follow the above steps to prepare all the ingredients. Pour the cream cheese batter into a cake mould. Wrap the cake mould bottom with foil. Place in a tray of hot water. Bake in a preheated oven at 160C/335F, for about 65 to 70 minutes. 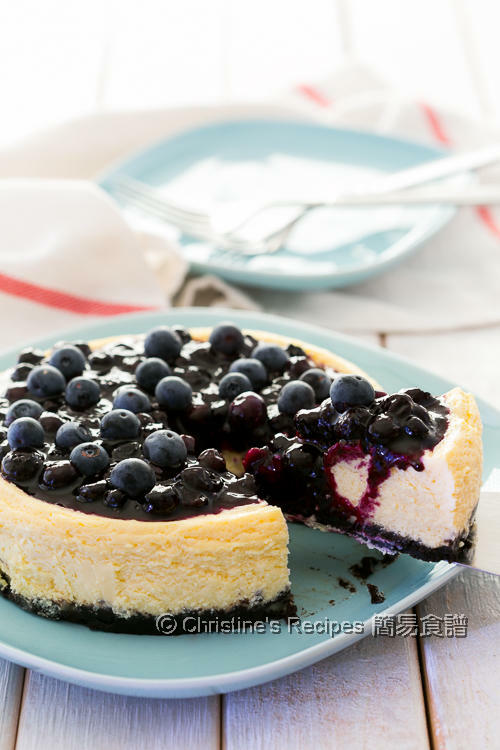 If the surface of the cheesecake rises too high and too quickly, reduce the oven temperature. Continue to bake until cooked through. If an inserted needle comes out clean, it’s done. Follow the remaining steps to chill the cake and prepare blueberry coulis. Use a small saucepan, heat the blueberries, sugar and lemon juice over medium-high heat, until the berries are softened. Mix the cornflour with water. Stir it into the berry mixture and cook to your preferred consistency. Remove from heat. Let it cool completely. Drizzle on top of the cheesecake. Garnish with more fresh blueberries. Enjoy! Remember to cover the cheesecake with foil when cooking in an Instant Pot. It prevents the condensed water from dripping on the cheesecake surface. Don’t hurry to remove the cheesecake from Instant Pot once it finished cooking time. Open the lid for a few inches and let the cheesecake sit inside for a while. After chilling, the cheesecake surface will shrink a bit. It’s normal if it’s not too serious. It holds the blueberry coulis perfectly there. In Australia, a packet of cream cheese weights 250 grams. So I used 1½ packet. The remaining half packet was used to make this cream cheese toast. This is way too cool! I can't wait to give it a try, Christine. Hi Christine, just wondering why do we wrap the mound bottom with foil? Also, for oven method, how high should the water level be against the mound (halfway)? The cheesecake is baked in a water bath. By wrapping the base-removable mould with foil, it helps prevent water from sipping in. The water is up to about 1 inch or 1.5 inches. It should be enough for lasting until baking is finished. Thank you so much! I love your recipes. They are so accurate. 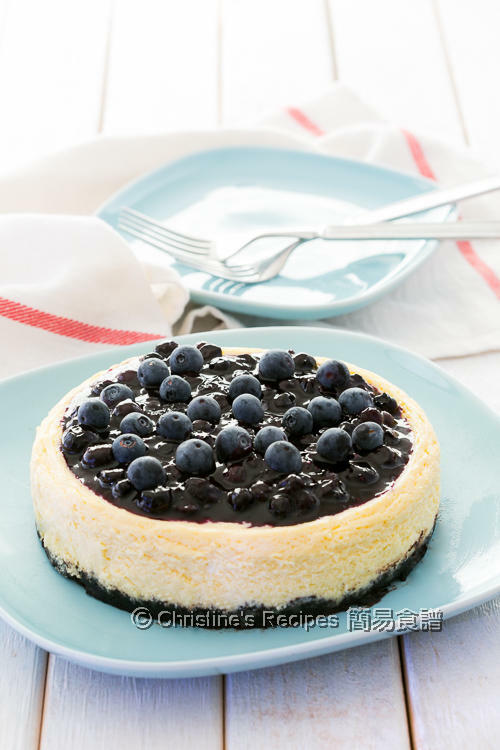 Hi Christine, I found there are slightly difference in terms of ingredient in this recipe as compare to the mini blueberry cheesecake recipe, for e.g. this cake is using cake flour but not in mini recipe. Is this cake more fluffier than the mini recipe? As you've known the ingredients in both recipes are quite similar, the taste and texture are quite similar too. The cake flour can't help to make the cake texture more fluffier, as it's not a raising agent, but to balance the moist inside since it's steamed in a pressure cooker. Hi Christine, i tried this recipe 2 times with water bake in oven. I need to ask you, if you have problem in water leak into the crust? I am using a removable base pan and wrapped with 1 layer aluminium foil, about 2-3" height around the pan. I did have a bit of water sip through the crust. Think that it's because of the high pressure. After letting it cool down on a wire rack and chilling in my fridge, the cake was good and the crust wasn't mushy but hardened as I expected. Are you using Large eggs? How many gram per egg with the egg shell? Yes, I used large eggs, about 59 grams each with shell. Thank you with your prompt reply! Caster sugar is a very fine sugar that dissolves easily and quickly. Normally I use for baking. It's much finer than granulated sugar. You may grind your granulated sugar in a food processor for a few minutes in order to get it finer. Can you tell me what you mean by “thick cream?” Is that what we call whipping cream in the US? Yes, it's a kind of whipping cream. Thickened cream contains 35% milk fat. Similar as heavy whipping cream in US.